Emily and Shaneil invited me to document their wedding at the majestic Chaminade Resort in Santa Cruz. The setting was incredible, and the Muslim and Hindu ceremonies that sanctified the day were full of meaning. It was quite an inspiring day – there was beautiful sunlight, there was color – red and blue and gold everywhere. But, in my opinion, the most important moments of this day could have happened anywhere. Strip away the guests, the mantras, the finery and the feast. Strip away the music, the dancing and the applause. Strip away the entire world, and what would be left is the way that Emily and Shaneil looked at one another. 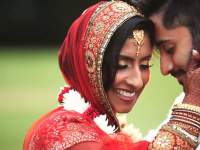 Sasha Kino presents cinematic wedding videography in the San Francisco Bay Area and for destination weddings. All wedding films and engagement films are shot with professional Canon HD cameras, using state of the art grip and lighting equipment. If you are looking for a wedding videographer, Sasha Kino is available for bookings for wedding video in San Francisco and for destination wedding videography.